The proverbial light at the end of the tunnel is emerging! With just under a quarter of the schedule to go, intensity has ramped up, the race for the playoffs is heating up and the reason we play is almost here. Hi again, everyone, and thanks for checking back for another edition of my blog. Phew, I feel like it was just a week ago I was writing my last blog about the dog days of the season and how I was dealing with it. All that has changed though, and as we look toward our stretch run to the Calder Cup playoffs, there is a new sense of excitement. For those who maybe haven’t followed our American League standings, we are in a tight race for first at this time, but while we are one point out of first in the division, the last playoff spot is only seven points behind us, so these next couple of weeks are both important and exciting. While we enjoyed a lot of success through December and January, February wasn’t a cakewalk. You could tell the wear and tear of a long schedule was taking its toll on us both mentally and physically. As we have gone through our first practices of the month, I can sense that urgency that teams get as they make their push towards April playoff hockey, and hopes for more. We all believe, as everyone else does, that we are more than capable of competing into June, but at the same time we know it won’t be easy or given to us. What we do have is a group that has either won it (2017) or come to Grand Rapids looking to add a championship to their resumes. I think this combination of past experience on one hand and the eagerness to taste the thrill of winning on the other bodes well for us going forward. 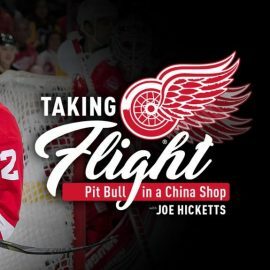 While focus has shifted entirely to Grand Rapids, there is still a long-term goal of joining the Detroit Red Wings. People often ask if, let’s say in Filip Hronek’s case, there is any resentment about him getting called up and the answer is no. I’m happy for Fil and him getting his chance to prove himself at the NHL level. We have become good friends over the last two years and for him to get his opportunity is exciting. At the end of the day, my goal is to win the Stanley Cup in the NHL and players here in Grand Rapids will no doubt be a part of that. What it makes me do is work harder, be more eager to get to the rink, and ultimately feeds an inner drive to not only get me to the NHL, but be able to succeed at that level. Now on to something that broke the hockey community’s heart this past week, the passing of a legend, Mr. Ted Lindsay. While I only met Mr. Lindsay a couple of times, he was always upbeat and open to sharing stories about hockey and life. He was the epitome of a hockey player, gracious off the ice, and a true warrior on the ice that rightfully garnered the infamous nickname we all still know him by, Terrible Ted. The biggest compliment in life is to be gone but never forgotten, and you sir, Mr. Lindsay, will never be forgotten. One of the toughest to play against on the ice, and a gentleman off it, he will be honoured every June at the annual NHL Awards with the presentation of the Ted Lindsay Award. His commitment to the community will remain with the Ted Lindsay Foundation, his dedication carried through the players and the players’ union, The NHLPA. Most importantly his legacy, to be continued on by his family, about whom I know he cared so deeply. Rest in peace, Mr. Lindsay.